As single women, it’s so easy to consciously or unconsciously to believe your life is about finding The One. So you spend your time, energy, and money doing just that. The problem with that is, it’s not who you are, and if you put all your resources towards it, you’ll probably begin to identify with it. But you’re not a woman who lives to date! My guest today in her work helps women to connect with each other, share their stories, and birth creative projects into the world. This turns 2-D living into 3-D living, so that when you do enter into your next relationship, you don’t lose yourself in the process. 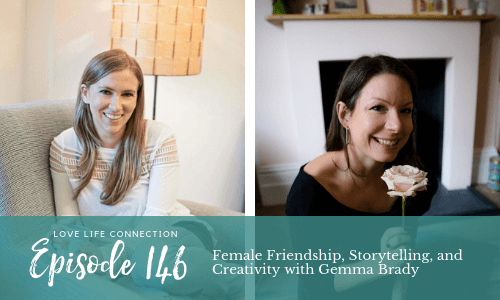 Gemma created Sister Stories as a means of offering women an opportunity to come together to be seen and heard, experiencing an expansive evening of truth telling, healing and transformation. Grounded in the primal and magical traditional of storytelling, Sister Stories events invite women to depend their sense of connection to the self and one another, experiencing the simple joy of knowing we are all in it together. What started as a simple women’s circle gathering in London has grown to a thriving, supportive movement with 15 women leading Sister Stories gatherings in their local communities. Struggling to get over your ex? Join my brand new, totally free Get Over Your Ex Challenge. Learn a whole new way to turn your breakUP into a breakTHROUGH. Sign up for free HERE. Ready to transform your life and love life? Learn more about working with me 1x1 and in small groups HERE.